Albrecht Dürer's House (German: Albrecht-Dürer-Haus) is a Nuremberg Fachwerkhaus that was the home of German Renaissance artist Albrecht Dürer from 1509 to his death in 1528. 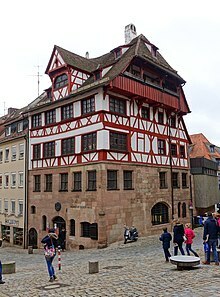 The House lies in the extreme north-west of Nuremberg's Altstadt, near the Kaiserburg section of the Nuremberg Castle and the Tiergärtnertor of Nuremberg's city walls. The house was built around 1420. It has five stories; the bottom two have sandstone walls, while the upper stories are timber framed; the entire structure is topped by a half-hip roof. In 1501, it was purchased by Bernhard Walther, a merchant and prominent astronomer. Walter remodeled the house, adding small windows to the roof so that it could function as an observatory. Walther died in 1504, and Dürer purchased the house in 1509. Since 1871 the Albrecht-Dürer-Haus has been a museum dedicated to Dürer's life and work. In a restoration of 1909, the large dormer on the east-facing roof was replaced. (Compare the earliest known engraving showing the house, from 1714 with this photograph taken between 1860 and 1875 with this postcard from 1909. ) In October 1944, it took significant damage from Allied bombing. It was rebuilt by 1949, but did not reopen as a museum until 1971, Dürer's 500th birthday. The museum features installations of period furnishings, a re-creation of Dürer's workshop in which visitors can view demonstrations of printmaking techniques, and rotating exhibitions of drawings and prints by Dürer from the City of Nuremberg's Graphic Collection. Visitors can also receive a guided tour of the house from an actress playing Agnes Dürer, the wife of the artist. ^ Note on name: Although many German museums are referred to in English by their German names (for example, the Pinakothek der Moderne or the Gemäldegalerie), the Albecht-Dürer-Haus refers to itself as "Albrecht Dürer's House" Archived 2012-02-05 at the Wayback Machine on its English-language website. ^ "Das Dürer-Haus im Lauf der Zeit Archived 2009-07-06 at the Portuguese Web Archive"
^ Costumed Guided Tour with Agnes Dürer, Albrecht Dürer's House. Retrieved 3 March 2012. This page was last edited on 18 April 2019, at 12:07 (UTC).